Time, and time, and time again, larger organizations are opting for coworking when considering their next office. IBM, HSBC, and Microsoft are the heavy hitters making the news, but they don’t stand alone. KPMG, The Guardian, and General Electric have all opted for comparable arrangements, placing departments or even entire operations within shared space environments. Some may ask, why would large corporations transition to a shared workspace where outsiders would have access to their day to day? Also, some assume that cost is much expensive than a traditional office. While that does sound familiar, we’ve developed a list of reasons why we think it’s a good idea for larger companies and corporations to move to shared workspaces. Whaaaaaaat? Bear with me. While the sticker price is obviously higher to move to a coworking office than a traditional lease, there are a substantial amount of factors that make coworking a highly competitive option. Whether it be simple amounts, or taking convenience into consideration, there’s plenty of reasons, I promise! Startup Costs: Traditional leases require four to six months of rent for a security deposit for a long term lease (5 years+), and that’s on the low end. Not to mention running electrical, configuration, proper legal considerations, IT operations, etc. Racking up a six to seven figure bill for build out is incredibly easy to do, and that’s before people are even in the space! Coworking? One month down, all utilities included, and comes with an already built out off to fit your company’s needs. Need customizations? Pending size, coworking companies are likely to foot the bill or create a custom office for you. Furnishings and Maintenance: Despite huge volumes in New York, desks and chairs surprisingly aren’t free! When managing your assets, taking into account the depreciation of your everyday materials can build up quickly. Coworking spaces come fully furnished with proper desks, chairs, lounge areas, kitchens, etc. Not to mention cleaning and security! Choosing coworking allows you to relinquish the stress of day to day management of your surroundings. The biggest pain point of a 15-20 year lease, is that they’re 15-20 years long. Nobody knows what their operations are going to look like a few decades from now, so why lock yourself into something so long? Coworking spaces (at least in Manhattan and Brooklyn) typically list their agreements as weekly, monthly, or yearly. You aren’t forced into any substantial terms that can’t be properly planned for, with the upward bound being maybe 2-3 years. Not to mention turnover time! Traditional leases take weeks or even months to put together. Coworking agreements take a matter of days (at most). Move in ready options, with substantially less burden. Cubicles and traditional office settings are on the way out. Design, aesthetic, authenticity, and community now lead the way in deciding factors for many choosing a shared space (or even to join a new company!). An attractive space attracts the right talent, and larger organizations are conscious of that fact. Do your employees a favor and choose coworking (*cough cough, Bond Collective*) to increase productivity and happiness in the workplace. The most important part of shared spaces are those around you. While primarily an asset for smaller businesses searching for more business, leveraging the people that work around you can lead to new personal and professional relationships not found elsewhere. To get a bit more ‘capitalism’ on ya, Fortune 500 companies have found great success partnering with coworking spaces to offer discounted programs or solutions to members. Microsoft is the hallmark of this angle in providing a suite of products to affiliate spaces. Dollars and cents aside, I know I’m not alone in saying I’ve made some great friends and connections via members in our spaces. Each community is unique in its own right. Do your employees a favor, don’t limit their social and professional pool unnecessarily, and allow shared spaces to expand their horizon. While an aspect largely of those new to the workforce, employees and prospects expect a certain ‘wow factor’ when walking into their employer’s doors. Yes, you can put time and money into improving your own arenas into ultra-attractive productivity centers (cheers to you, Facebook), every Financial Controller will take a look at the price tag and shudder at the number. Do your recruiter a favor, and explore shared space options, especially those that emphasize design and amenity sets. While square footage and cost are one thing, user experience is a whole nother beast. The easiest way to get your employees excited about coming to work in the morning is securing a space they WANT walk in the door every morning. All fluff aside, shared spaces make employees happier, and while not inherently measurable, your bottom line will thank you. These factors aside, take a step back and analyze your operations. Could shared spaces be feasible? Do your employees and executives work better in open or closed off spaces? What does your company footprint look like and what do you anticipate it looking like over the next few years? The answer may be that shared spaces aren’t ideal, but without fail, larger and larger organizations are disagreeing. While we obviously advocate holistically for shared space alternatives (duh, we’re a coworking space), the bottom line is that many are noticing the scales tipping towards the model. 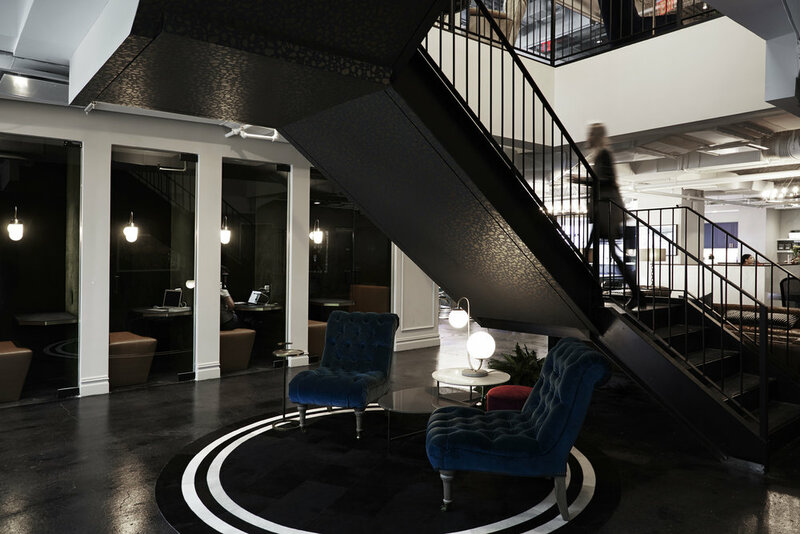 Companies and organizations that want to stay ahead of the curve should take a look at coworking as an attractive alternative to ‘traditional’ leasing. The obvious answer: Bond Collective’s doors are always open to companies that are looking for a new headquarters. Featuring custom outfittings for teams of 50-100+, no undertakings are too large or too small for us to handle. We want to hear from you, and bet that you’ll like what we have to offer. Michael is a graduate from the University of Wisconsin with a dual degree in Economics and Integrated Studies. A recent transplant to NYC, Michael lives with complete strangers in a walk-up in Brooklyn, and runs an art platform in his down time. Passionate about building assets that aid professional direction, Michael joined the Bond Collective team to help the development of member offerings, outreach, and services.